I studied Naturopathic Medicine at Bastyr, which is one of the seven accredited schools in North America. Naturopathic medicine is an integrative approach to healthcare based on the principle that the body has an inherent ability to achieve and maintain health. Naturopathic medicine combines modern scientific research with traditional wisdom and the healing power of nature to provide safe, effective treatments that bridge the gap between natural and conventional medical perspectives. 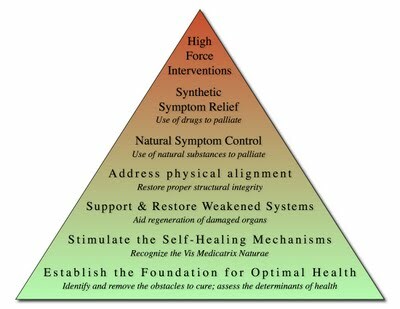 We work with the therapeutic order (see pyramid below) to establish conditions of health and treat the whole person. Diagram courtesy of Natural Medicine is the Best Medicine. Naturopathic doctors attend four-year graduate-level naturopathic medical schools and are educated in all of the same basic sciences as conventional doctors, in addition to extensive study of holistic and nontoxic approaches to therapy, with a strong emphasis on disease prevention and optimizing wellness. In conjunction with a standard medical curriculum, naturopathic doctors complete four years of training in clinical nutrition, homeopathic medicine, botanical medicine, manipulative therapy, hydrotherapy, and counseling. Naturopathic doctors are able to collaborate with their patients’ other medical providers to insure the best in integrated medical treatment. When we become sick, our body’s natural ability to heal itself needs to be strengthened in order to reverse disease. Naturopathic doctors take the time to listen to our patients in order to better understand them as individuals and to unveil the root cause of their illness, and how to best address each individual’s needs. Naturopathic doctors do this by using a variety of safe and effective therapies including nutritional and lifestyle counseling, homeopathy, herbal medicine, therapeutic bodywork, physiotherapy, and hydrotherapy. Listed below are the principles upon which naturopathic medicine is founded. The body has an inherent wisdom to heal itself. The healing power of nature (vis medicatrix naturae) is the inherent self-organizing and healing process of living systems which establishes, maintains, and restores health. Naturopathic doctors acknowledge this healing process as ordered and intelligent and facilitate this process by identifying and removing obstacles to health and recovery. Naturopathic doctors look for the underlying cause of disease, whether it be internal or external. Symptoms are an expression of imbalance in the body and we strive to unveil the underlying cause of your illness. Without identification of the underlying cause, recovery can not occur and treatments often fail. Suppression of symptoms may cause the underlying cause to exacerbate and problems will continue to arise. Oftentimes, once the underlying cause is addressed seemingly unrelated symptoms disappear and optimal health and prevention begin. Naturopathic doctors first priority is the health and safety of the patient. We use the least invasive therapy possible to treat you. We avoid suppression of disease (and sometimes even palliation). We work with the healing power of nature (vis medicatrix naturae). We refer out when that is what is best for the patient. We are trained in primary care, preventative medicine and natural therapies and work as a part of your integrative health care with many other health care professionals. The word doctor stems from the latin word, Docere – to teach. Education is a key component of naturopathic medicine and is also key in achieving and maintaining your own health. Through education Naturopathic Doctors empower our patients to take responsibility for their own health. We help you learn how to best care for your body to maintain health and prevent disease. The human body is an integrated whole: body, mind, emotion and spirit are all factors in your health and wellness. Naturopathic Doctors treat each individual with a personalized approach and comprehensive health and prevention plan. A thorough intake ensures a comprehensive diagnosis and treatment plan so that all of your health needs are being met. Prevention of disease and achieving optimal overall health are primary objectives of naturopathic medicine. This varies from person to person based on various risk factors; genetics; social, family and personal history and health status. Naturopathic Doctors promote optimal health by educating patients about nutrition, lifestyle choices, and many other areas of healthy living including mental, emotional and spiritual health. We work with you to help you achieve your optimal health and disease prevention. Locate an ND near you! Hey thanks for giving me credit for the diagram!! Nice post about the basics of naturopathic medicine! Thank you Erika – great job with the diagram! Thanks for the feedback Molly! !